The two Bali Nine defendants, Myuran Sukumaran and Andrew Chan will be executed together as soon as Chan's clemency bid is denied. One Indonesian, Rani Andriani, alias Melisa Aprilia, and five foreign nationals: Daniel Enemuo (Nigerian), Ang Kim Soei (Dutch), Tran Thi Bich Hanh (Vietnamese), Namaona Denis (Nigerian) and Marco Archer Cardoso Moreira (Brazilian). Security has been stepped up at Nusa Kambangan, in Central Java, where five of the executions will take place. Under international law, drug-related crimes do not meet the threshold of the “most serious crimes” for which the death penalty can be imposed. Indonesia deserves the world's revulsion. Please do not give your tourist dollars to a country that violates human rights and international law by killing drug traffickers. There are beautiful beaches all over the world. If you want to vacation in the Pacific, go to the Seychelles, Mauritius, or Fiji, none of which execute drug traffickers. Please do not give your tourist dollars to a country that violates human rights and international law by killing drug traffickers. 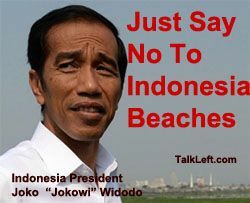 Isn't it a bit hypocritical to be singling out Bali when we live in a country that also violates human rights? See - Torture, Guantanamo. Btw, most Muslim countries impose the death penalty for drug trafficking and that includes all our allies in the Middle-East. The fact of the matter is that it is not the business of the US to interfere. No US citizens are involved. I would prefer it if the US government did not meddle in the affairs of other countries UNLESS UNited States citizens are involved. THe US would be in MUCH better position if we did not meddle in the affairs of other nations. whose citizens are being executed. No one from the U.S. is being executed this weekend.